The Black Spruce is a slow growing northern species featuring dense foliage and good shade tolerance. It only grows to about 30ft tall except in rare circumstances. This species grows in a small narrow columnar shape and is tolerant of shade. Therefore Black Spruce is well-suited to tight planting spaces where houses and other objects tend to block the sun. It is commonly found in the Great Lake States and the Northeast US, and is widespread throughout Canada. Although Black Spruce is generally a zone 2-5 species, it can do well in zone 6 if planted in a persistently moist location. It is a perfect species for wetlands and lowland locations around ponds and streams. Black Spruce is a good companion species for the similarly wet-loving but deciduous Tamarack Larch. 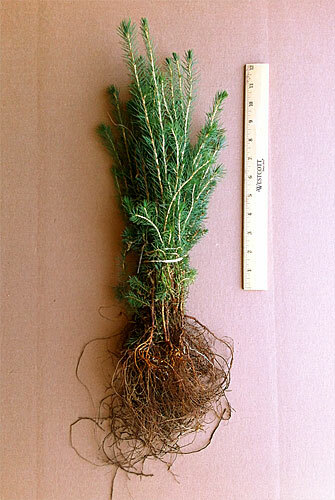 Black Spruce seedlings are remarkably tolerant of poor soils, and are relatively free of pests and disease. They are a “climax species”, meaning they tend to be the last plants to mature in a disturbed area [drought, fire, etc.] but eventually dominate all others until another major disturbance takes place.